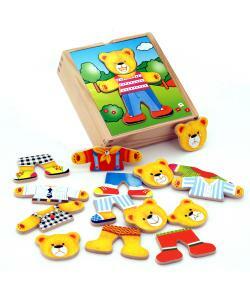 Dress up bear in many different outfits, matching or mixed up! You can also pick a face; happy, sad or laughing. 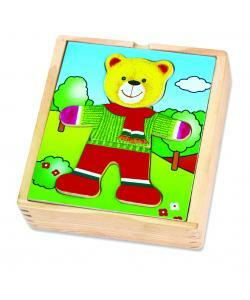 This beautifully crafted wooden box set includes 6 x 2 piece wooden outfits, 6 x wooden bear faces and wooden storage box with lid. 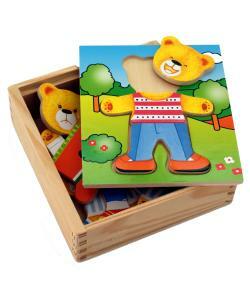 All the pieces stow away in the sturdy wooden box and the game can be played on the colourful lid. 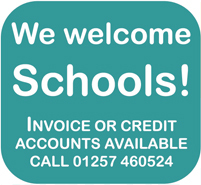 Great for developing co-ordination, dexterity and of course the imagination. 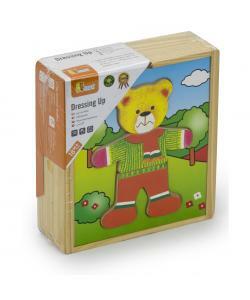 This wooden Bear Dress Up by Viga contains a variety of brightly coloured wooden pieces, including outfits and bear faces with different expressions, that slot into the lid. When the play session is over, the wooden pieces can be stored safely in the tray. Develops matching skills and reinforces everyday vocabulary. Helps to develop dexterity and co-ordination. Made from high quality, responsibly sourced materials. Consists of 18 play pieces.